I wanted to experiment with a rainbow cake recipe to see how it would turn out, plus who doesn’t love cake AND rainbows! Heat the oven to 190C/gas mark 5. Butter and line one 20cm sandwich tin. In a large bowl, beat all the cake ingredients together until you have a smooth, soft batter. 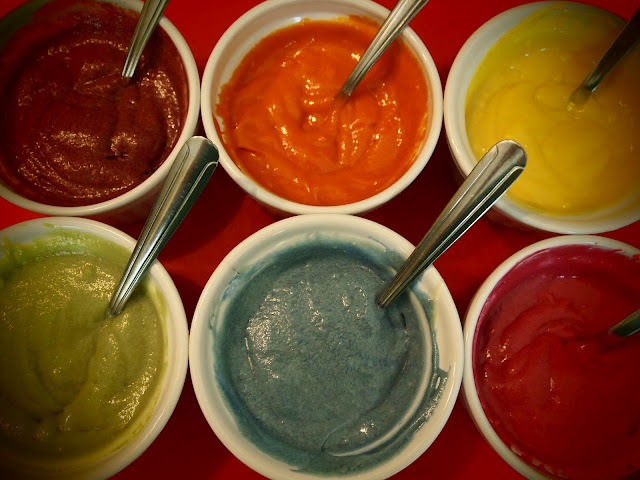 Divide the mixture evenly between 6 small bowls (depending how many colours you are using) add a teaspoon or more of different colour to each bowl, some colours may need more adding to become more vibrant. Mix thoroughly. 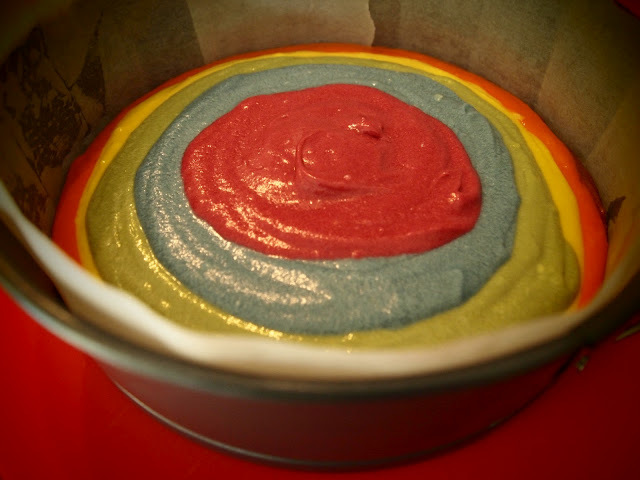 Slowly pour each coloured mixture into the cake tin, one at a time on top of each other until it spreads out forming a smooth surface. Bake for about 30-35 mins until the cake springs back when pressed. Place onto a cooling rack and leave to cool completely. To make the buttercream icing, beat the butter until smooth and creamy, then gradually beat in the icing sugar. Beat in vanilla extract. Spread the butter cream over the cake. Keep in an airtight container and eat within 2 days. Gallery | This entry was posted in Recipes / Food and tagged Baking, Birthday, Birthday Cake, Cake, Food, Rainbow, Rainbow Cake, Recipe. Bookmark the permalink.